Want to hear some words of wisdom? “Rain melts snow.” Yay! So if these gray, rainy days have been getting you down, keep the faith. Slowly the snow is disappearing and the gardens are waking up. Yesterday my first winter pansy bloomed outside my window. I had planted them late last fall. The beds at work are a sea of blue flowers- Iris reticulata and Scilla siberica bulbs blossoming everywhere. Hellebores are back on track, opening their new buds the instant they break free of the snow. And the birds… They are singing so loudly I simply have to stop and listen and enjoy, no matter how rushed I am. 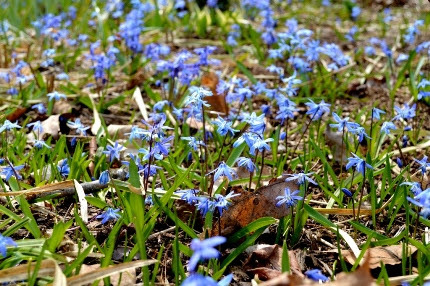 Our gardens are becoming a sea of blue Scilla blossoms. These early bulbs are SO important for our early pollinators. What’s blooming in YOUR garden this week? As the early spring flowers emerge, it is important to understand just how vital their nectar and pollen is for our native pollinators. They fly earlier and at much cooler temperatures than honeybees and NEED food. 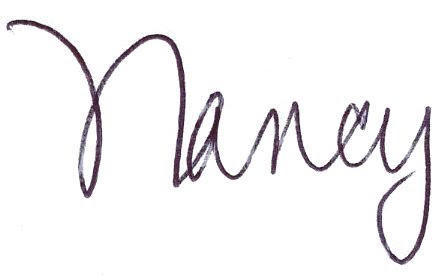 A few weeks ago I gave a talk to the Master Gardeners called “The Bookends of the Season”. It put a laser beam focus on the tons of extra early and extra late bloomers that we can provide for mason bees and many other important native species. NOW is the time to hang up your mason bee houses and refresh the tubes from houses you have put up in years past. 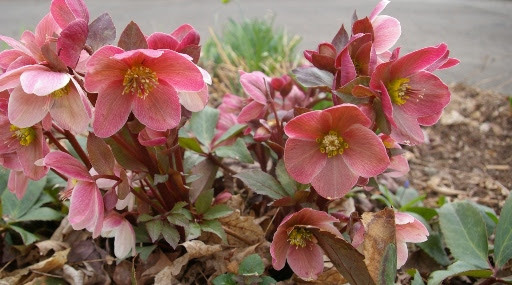 Hellebores are blooming in all of our gardens this week. emerge very quickly. Meanwhile, the flowers are the star of the show. 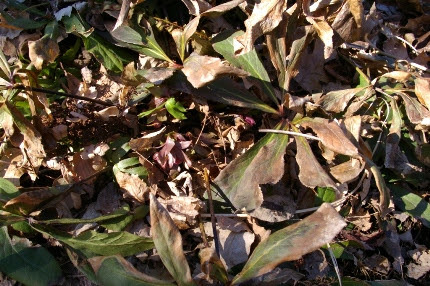 As you can see by the picture above, I don’t rake all the leaves out of my own gardens. I leave them to decompose and feed my plants. Then, in mid-April, I topdress my perennial beds with compost and organic fertilizer. Only then do I add a fresh layer of mulch. By that time, lots more perennials have emerged along with “free gifts”, my beloved self-sown seedlings of annuals, perennials, biennials, and herbs. You’ll notice my sickle handle is painted purple so no one tries to “borrow it”. I couldn’t live without this tool! like we’ve done here and at the CT Flower Show. I chop a lot of my debris up and put it right back on the ground rather than hauling it away to the compost. It’s a technique that some people cannot embrace because, for a few weeks, the garden doesn’t look neat and tidy. But it sure does save work AND adds lots of freeorganic matter to the garden. I learned this from the great book The Know Maintenance Perennial Garden by Roy Diblik. I saw Roy speak a few weeks ago at a conference and he was so incredible. What he talks about makes sense, especially as I get older and continuously try to reduce my labor. 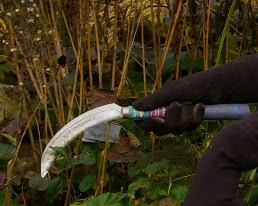 Of course, I wouldn’t venture out to the garden without my handy dandy garden sickle. This saves so much repetitive motion when cutting back the garden right now. can also begin this week. Luckily, I am teaching my annual Pruning Workshop at the Zion Episcopal Church in North Branford this coming Saturday from 10-12. Walk-ins are welcome. I can teach anyone how to prune! Once you have taken this class, you will have a deep understanding of the different categories of plants and the various ways to prune them for longevity, flowering, and beauty. Check out the Potentilla in the photo on the left. What would you do to it right now? This shrub blooms on current year’s wood starting in June, repeat blooming into the fall. Below is Hypericum ‘Hidecote’. 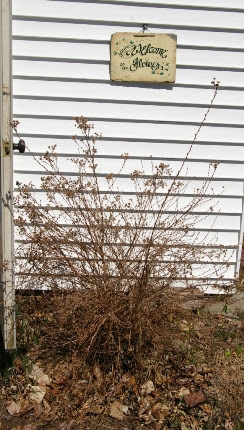 This shrub is what we call a dieback plant. The old wood basically dies to the ground each winter. I cut it back to ground level, removing all of last year’s growth. It takes courage, but it’s the only way to deal with this fabulous deer resistant, long blooming flowering shrub. Spring bloomers such as lilacs, rhododendrons, andromedas, quinces, and so many more are to be LEFT ALONE as they bloom on last year’s wood. Any pruning now will cut off their flowers. Don’t you want to take the pruning class with me and learn a lot more??? I will be leading our first Saturday Morning Garden Walk on Saturday, April 8th at 10 am. (*Note the time change of our weekly walks this year!) I will demonstrate cutting back perennials and pruning of shrubs that bloom on current year’s wood. Speaking of classes at Natureworks, this coming Saturday Jillian is leading a workshop called Seeds Made Easy. After watching Jillian teach two classes last Saturday at Grow Day, I have to say she is an amazing teacher. Let her hold your hand while you plant a tray of mixed seedlings, customized for your own garden. On Sunday, Kassie will be leading a workshop Get a Head Start on Dahlias. Kassie adores dahlias and has grown lots and lots of them in containers in her backyard. She will lead students in a class to help you understand their needs and pre-starting them in containers in advance. The following Saturday, April 8th, Jillian will teach Lettuce and Alyssum Bowls. Plant and grow your own salad garden. Why alyssum with lettuce? This cold-tolerant, very fragrant annual attracts beneficial insects that prey on aphids that attack lettuce. It is practical and pretty! The alyssum will keep blooming until very late fall. Registration is required in advance for all three of these workshops. See all the details below. Sweet alyssum is not only great in combination with lettuce, it is also one of my very favorite early spring annuals. 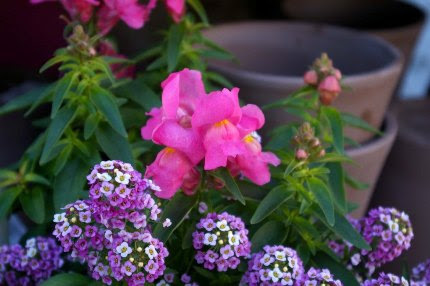 Shown here with snapdragons, both of these plants will keep on going until late fall! A great selection of cold tolerant annuals will be arriving the first week of April. This is an organic granular powder that is added to the soil around your plants in the early spring when they start to grow. It is taken up into the plants and makes them taste like hot pepper (the active ingredient is capsaicin). We have used this in our gardens and those of our clients and we are thrilled with the results. Once inside the plant, it lasts for three months! Wow! The only caveat is that you can’t use it on edible crops as it will make them all taste very hot! eggplants, and tomatillos. They should be started indoors six weeks before planting outside. Since our last frost free date is mid-May at the earliest, now is the time! 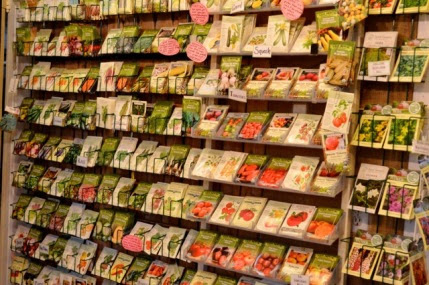 Our seed selection is simply amazing right now. Our racks are completely restocked and we have so many rare and unusual varieties, including the new dwarf tomatoes featured in the book Epic Tomatoes by Craig Lehoullier. I took a look at this book and have to say, if you are looking for a gift for a tomato growing fanatic, this is IT! This guy is all about tomatoes and has been working for over a decade to develop dwarf tomatoes. 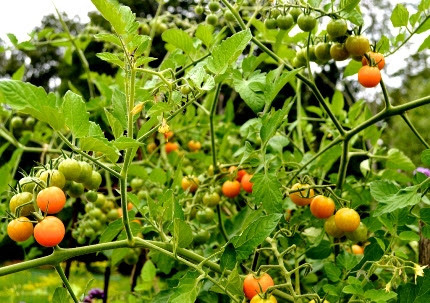 They are 3-4′ tall plants that have that delicious, heirloom flavor. Ideal for containers and smaller gardens, they don’t require super-sized tomato cages and rolls of twine to keep under control. When are the plants arriving??? We already have pansies, Ranunculus, and some other early annuals in our greenhouse. They go outside on nice days. BUT, pansies have been planted in our containers by the road and have been staying outside since last Friday and they’re fine! Aren’t we brave! This Friday the first of our perennials arrive. Next week the real fun begins with shipments expected of cold-tolerant annuals and even some early veggies. 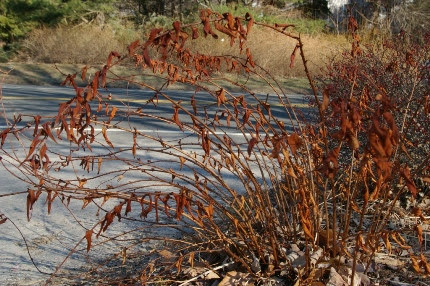 I wouldn’t be surprised to see some shrubs rolling in as well. The organic fertilizer shed is fully stocked, as are the pallets of compost and topsoil surrounding our parking lot. The rhubarb and garlic is up in Veggie Island. Be sure to check out all the action when you come for a visit.